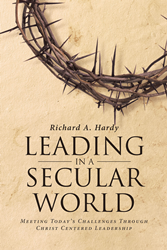 Richard A. Hardy’s newly released “Leading In A Secular World: Meeting Today's Challenges Through Christ Centered Leadership” is a must-read for the modern believer. “Leading In A Secular World: Meeting Today's Challenges Through Christ Centered Leadership” from Christian Faith Publishing author Richard A. Hardy is a sane and accessible approach to leading people to Christ in a tumultuous, unbelieving world. “Leading In A Secular World: Meeting Today's Challenges Through Christ Centered Leadership”: an engaging operating manual for Christ’s shepherds, is the creation of published author Richard A. Hardy, a leadership coach and founder of Leadership in Black and White, a leadership support and development ministry. He lives in upstate South Carolina. Published by Christian Faith Publishing, Richard A. Hardy’s new book is a vital and culturally relevant work that makes clear the greatest challenge and assignment given to every serious believer, whether they lead from the pulpit or by example in their daily lives. View a synopsis of “Leading In A Secular World: Meeting Today's Challenges Through Christ Centered Leadership” on YouTube. Consumers can purchase“Leading In A Secular World: Meeting Today's Challenges Through Christ Centered Leadership” at traditional brick & mortar bookstores, or online at Amazon.com, Apple iTunes store, or Barnes and Noble. For additional information or inquiries about “Leading In A Secular World: Meeting Today's Challenges Through Christ Centered Leadership”, contact the Christian Faith Publishing media department at 866-554-0919.